The most recent Apple supplier report is mostly a rehash of previous years —but includes one entry from a facility that appears to exclusively produce car parts and support equipment for automobiles. 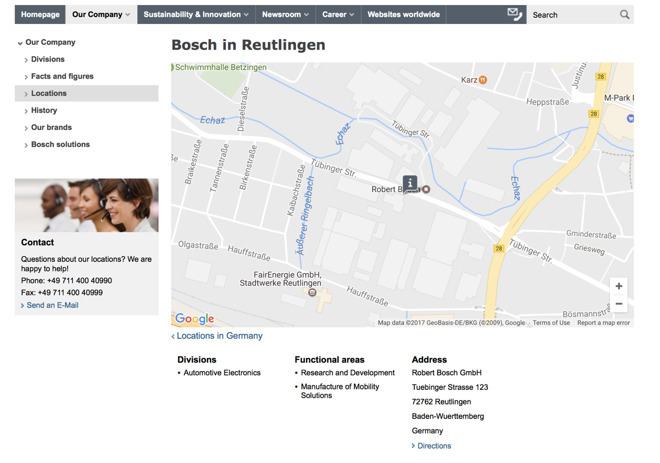 For the first time, Apple lists Robert Bosch GmbH (or Bosch) as a supplier. Specifically, the Tuebinger Strasse 123 facility in Reutlingen, Germany. Bosch is a multinational company that produces a great many products, including electronics components like the barometric sensor in the iPhone 6s. The facility that Apple lists as its supplier is specific to automotive electronics, with "functional areas" of research and development, and "manufacture of mobility solutions" like wheelchairs and similar. Obviously, it is unknown what specifically Bosch provides to Apple beyond the reported barometric sensor. However, AppleInsider has confirmed with Bosch employees not authorized to speak on behalf of the company that the only products to come out of the Reutlingen facility are automotive and mobility-enhancement related. The "mobility-enhancement" products that come out of the facility are wheelchairs, gait trainers, and the like —nothing like what Apple features on its magnet page for accessibility accessories. It is unclear where exactly Apple stands with Project Titan. While once thought to be a whole-car project with a delivery in 2019 or 2020, more recent rumors suggest that the division has tightened up both its staffing and its focus, and is refocusing on self-driving software and supporting hardware under the aegis of long-time executive Bob Mansfield. More recently, Apple is said to have shifted to production of self-driving car software and hardware. Reportedly, the gear is testing in a virtual reality environment to keep prototypes away from the prying eyes of the public and competitors. In the eleventh installment of the report, Apple audited a total of 705 suppliers, up from 640 audits conducted in 2015, and the 633 audits in 2014. The report generally focuses on labor and environmental impacts of its suppliers, with this year's showing improvements in responsible sourcing, landfill diversion, and energy efficiency.